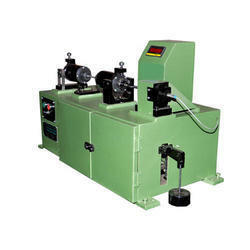 We are a leading Manufacturer of dynamic fatigue testing for springs, computerised rotating bending fatigue testing machine and fatigue testing machine for bridge bearing pads from Chennai, India. Dimension Height 600mm, Width 400 mm, Depth 250mm. 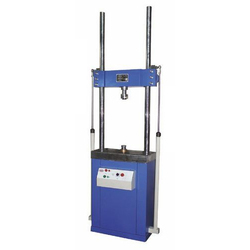 Capacity: 2 tonFrequency:1.5 HzMaximum displacement: +/- 20mm Samplemetal onlyLoad resolution: 20000 counts displacementresolution: 0.01mmControl: thru proportional valve systemFrame size: Height: 600mm,Width: 400 mm,Depth: 250mm. his research is centered on the design of a low–cost cantilever loading rotating bending fatigue testing machine using locally sourced materials. The design principle was based on the adaptation of the technical theory of bendingof elastic beams. Not only we present excellent products, but we are also flexible enough to make superfast deliveries and within the promised time. Stringent quality checks have been employed upon the raw materials which we source. 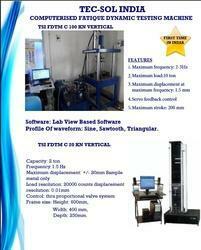 For this, we have hired special quality analysts who check the materials against different parameters.